23 members of the Irish Parliament sent a recent letter to President Barack Obama urging him to revoke the 20 Medal of Honor awards given to the soldiers who perpetrated the Massacre at Wounded Knee in 1890. They argue that the medals are a standing insult to the Lakota, and all Native Americans. The Lakota People’s Law Project steadfastly sides with the members of the Irish parliament in recognizing these honors not only represent a stain on United States history but taint the very prestige of the Medal of Honor itself. How did the Irish become involved in matters specific to Native Americans? The little-known shared history between the two sovereign nations holds several examples of fraternity and mutual understanding. 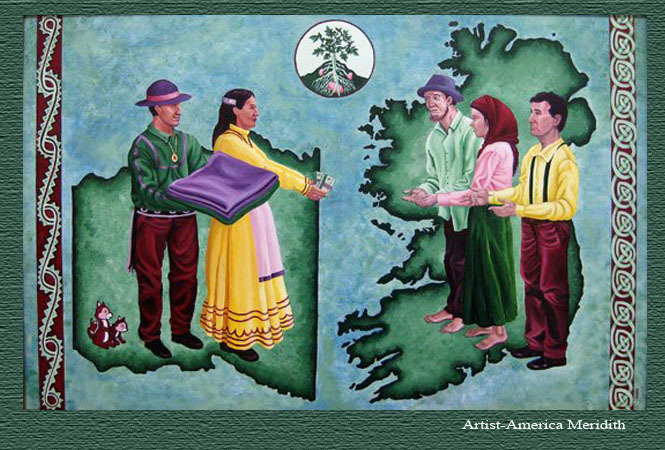 During the Irish potato famine of 1845-49, when thousands of Irish were starving as potato crops failed, the Emerald Isle received an unexpected gift from a group of sympathetic people across the Atlantic: the Choctaw Nation. At the peak of the famine In 1847, the Choctaws of Oklahoma heard about the terrible conditions faced by the Irish, and gathered together to see what they could do to help. The result was a donation of $170, what would today be $5,000, gathered from tribal members and sent to Ireland to relieve their suffering. This act of charity is especially significant when viewed in historical context. Just sixteen years earlier, the entire Choctaw Nation had been pushed from their homes in the Southeast and forced to march 500 miles to Oklahoma on the Trail of Tears. Thousands died of hunger, disease and exposure along this bitter journey, only to arrive in an unfamiliar and unwelcoming land. Despite the immense challenges faced by their people, the Choctaw still managed to extend support to the Irish in the hour of need. The generosity of the Choctaw during that difficult time left a lasting impression on the Irish, one that has resulted in a 1995 visit from Irish president Mary Robinson to the Choctaw Nation in Oklahoma, a commemorative plaque at the Lord Mayor’s mansion in Dublin, and now the unveiling of a beautiful statue in Cork, Ireland, by Irish sculptor Alex Pentek. The installation dubbed “Kindred Spirits” consists of nine massive steel feathers fashioned in the style of Choctaw ceremonial dress and arranged into a bowl, symbolizing the Choctaw appreciation of Irish suffering. Irish appreciation for the generous gift from a Native American community has also been expressed in other ways. In 1992, a group of Irish nationals walked from Broken Bow, Oklahoma, to Nanih Waiya, Mississippi, paying homage to the many Choctaws who lost their lives on this route. Then last year, 23 Senators across the political spectrum in Ireland signed the letter urging President Barack Obama to revoke the Medal of Honor awards given to soldiers who perpetrated the Massacre at Wounded Knee in 1890. The kindness shown by the Choctaw in 1847 earned them the lasting respect and appreciation of a foreign Nation well over a century later. Mainstream culture mistakenly views Native Americans as an isolated population, quarantined in the lonely, windswept regions of America’s heartland. This oversimplified view ignores the contribution of thousands of Native veterans who gave their lives for the United States in foreign wars, as well as the many Native activists who have won greater recognition for Indigenous people worldwide through their work with the UN. It also ignores the small but powerful donation from the Choctaw Nation in 1847, who reached out to give what they could to help a group of people they had never met, because they understood the importance of community and shared humanity in the face of abject suffering. Sue, in 1890, American Soldiers massacred at least 150 Lakota men women and children at Wounded Knee, SD, after a scuffle broke out in the camp (some historians put the number at 300 people, mostly women and children). Congress awarded twenty Medals of Honor to soldiers who participated in this senseless massacre. Thats more medals that SD veterans received in WWII! The Irish statesmen who signed this letter believe that these medals disrespect the women, children and men killed at wounded Knee, as well as other soldiers who have been awarded the Medal of Honor for their acts of great courage and sacrifice. Thank you for your question! were. Only a bunch of killers. this is what I think.